Please help me welcome to Medieval Monday my guest, Barbara Bettis. 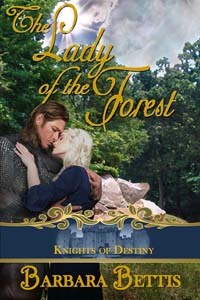 Barbara will be sharing a snippet from her novel, The Lady of the Forest. Be sure to leave her a comment to be in the running for our giveaway. Happy reading and enjoy! Follow along next week at Elisabeth Hobbs’s: https://elisabethhobbes.co.uk/ Don’t forget to comment for a chance to win an e-copy of The Lady of the Forest. Find my snippet of For All of Ever, on Barbara’s blog here. Thanks for hosting me today, Sherry. I adore the photo in your banner. Wouldn’t you love to be there right now???? Lady Katherine sounds like a great character. I admire her spirit.